Fluorescence Correlation Spectroscopy (FCS) is a fluorescence microscopy-based technique that provides information on diffusion rate, absolute numbers and changes in particle fluorescence of fluorescently labeled molecules. FCS measures fluorescence intensity fluctuations due to diffusion of fluorescent molecules through the confocal volume element or other measurable changes in the confocal volume element. The fluctuations are correlated over time, yielding quantitative information on molecular mobility and local concentration. Confocal fluorescence microscopy measurements in cells allow studying the interactions and dynamics of biomolecules in their native environment. 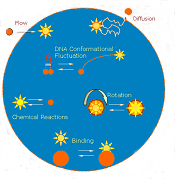 FCS has therefore become an important tool for various disciplines for following biological events and cellular processes. SETA BioMedicals offers a number of highly photostable fluorescent labels for use in FCS applications. For a comprehensive list of our proprietary labels we refer you to our Seta dyes. If you consider using FRET in combination with FCS in your application we refer you to FRET Applications, where we offer a series of FRET pairs with Forster distance from 40 – 80 Angstrom. Should you require a specific FRET pair that is not on the list please contact us. Our newly developed Squaraine-rotaxanes are extremely bright and photostable and well-suited for FCS measurements. SeTau-647 (SeTau-647-NHS and SeTau-647-Maleimide) is the brightest dye currently on the market for the Kr-ion laser. It combines a quantum yield of ~60% with an extinction coefficient of >200,000 M-1cm-1. SeTau-647-maleimide has been successfully used in the studies of the mechanism of muscle contractions using FCS, specifically fluorescence lifetime correlation spectroscopy (FLCS), lifetime and time-resolved fluorescence polarization methods . 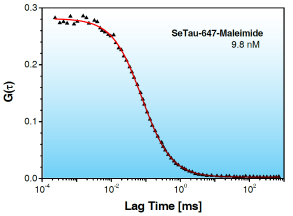 The diffussion coefficient was determined to be 2.5 μm2s-1 and the correlation time was 10.5 ms. Myofibrils were labeled at the myosin light chain 1 position with SeTau-647-maleimide. SeTau dyes have several important advantages over a single isomer of TRITC used in an earlier study. Most importantly, SeTau-647 dyes are excited in the red and thus have reduced autofluorescence. Furthermore, they are well suited for excitation with a 635 nm diode laser, and they have large Stokes shifts (44 nm), a much higher photostability than Cy5 or Alexa 647, have a high extinction coefficient, and a several times longer fluorescent lifetime than Cy5 or Alexa 647. The 3 ns fluorescence lifetime implies a relatively high polarization. SeTau 647 is a unique dye with a high excitation in the red region and a relatively long lifetime, two properties that are usually mutually exclusive . An average of 3.6 molecules was observed in the FCS measurement. When the 1/G(0) was plotted vs. the number of SeTau-647 molecules in the detection volume, the extrapolation revealed that the concentration contributed by one molecule of the dye corresponds to app. 75 counts per channel, i.e. the total fluorescence (Itotal = I║ + 2I┴) from one molecule of SeTau-647 is 225 counts/s. In a typical experiment the signal was 10,000 counts/s, corresponding to about 50 molecules .